The Asom Jatiyatabadi Yuba Chatra Parishad (AJYCP) on Monday staged sit-in demonstrations in different parts of Assam demanding Inner Line Permit (ILP) in the State. As part of the protest, the Guwahati unit of the AJYCP on Monday staged a three-hour sit-in demonstration demanding implementation of ILP system in Assam near Dighalipukhuri in the city. Roy also said that the infiltration problem in Assam has already changed the demography of the State in the past few years posing a serious threat to the existence of various small communities of the State. The AJYCP president demanded the BJP-led Central Government to implement the Inner Line Permit system in Assam for the greater interest of the indigenous people of the State. 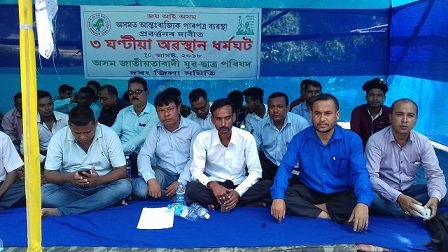 Meanwhile, reiterating their long standing demand for introduction of ILP system in Assam to safeguard the rights of the indigenous people of the State, the members of the Darrang district committee of the AJYCP on Monday staged a three-hour-long sit in demonstration at Mangaldai. Several prominent leaders and office-bearers of the students-youth organization including its district advisers Bhabesh Kakati, Kamrul Haque, president Diganta Deka, secretary Pankaj Deka took part in the demonstration. Later they submitted a memorandum to the Assam Chief Minister through the Deputy Commissioner, Darrang in support of their demand where they pointed out that continuous migration from neighbouring countries and States for the last several years has threatened the very existence of the ethnic and indigenous people of the State and only introduction of the ILP system could protect the rights of the indigenous people in future.